It’s not often you come across a prince of a man like Danny De Lillo. Open, honest, authentic and vulnerable, this man doesn’t hesitate in speaking up and standing up for what’s right and ethical. I had the honor of meeting up with Danny on the red carpet at New Filmmakers LA. Raised by a single mother in England, surrounded by his sisters, his aunt and his grandmother, Danny grew up with a strong female influence. It’s rare to meet a man with such a high level of respect for women. These women have had an enormous impact on his outlook on women and his desire to help achieve greater equality in the arts. I asked Danny about a special film entitled “Ageism,” that premiered at the festival. As a woman in her mid 50’s, I was intrigued that they premiered a film about the subject. It’s clear that Danny is a special gift to this wonderful organization with his dedication to emerging filmmakers and providing a means of removing previous barriers to entry and making filmmaking accessible to all. With Meryl Streep reciting a memorable quote from the late Princess Leia, “Take that broken heart and make it into art,” Danny is affording many men and women the opportunity to both channel and transform their personal pain into art on the big screen. Creativity has been known to be one of the most powerful means of transformation and Danny is on fire to bring down the walls and allow as many people as possible to use the medium of film to share their stories. “The new report is ‘shocking but sadly not surprising,’” according to Danny, which encourages emerging talents in the industry. He told ENTITY, “We need to be celebrating stories from all perspectives globally and consistently. That includes the people we hire behind camera. Humanly, we need to work together to change this…now.” The numbers are staggering: led by a shocking 22 percent drop in female directors in the world of film this past year. The old boys club remains in full force yet men like Danny are not afraid to take on this challenge and find a way to celebrate and honor women in the film industry. The statistics are disheartening with only 7 percent of the top 250 grossing films directed by women and only 4 percent of those in the top 100. Danny feels it’s time for a change and he’s leading that change having recently been appointed as Chairman of the New Filmmakers Film Festival. Sometimes life brings us unexpected pleasures. And one of my greatest pleasures was personally connecting with Danny to hear his story and the incredible impact the women in his life have had on his role at New Filmmakers LA as he is the international voice behind the organization. A British born actor, he isn’t afraid to use that voice to affect change where it’s needed most in the world of film. Recently, I was invited to The New Filmmakers LA Film Festival to interview two young artists dedicated to using the medium of art to inspire others. I was delighted to interview the lovely Meredith O’Connor, a young musician taking the world by storm with her powerful anti-bullying message and Keiran Valla, an emerging talent in the world of film. Overall, it was a powerful evening uniting in a celebration honoring emerging filmmakers. Danny is an alumnus of the prestigious New York Academy of the Arts and is a dedicated actor who starred in a short film, “The Host,” which premiered at the festival and led to his joining the Board to join in supporting emerging filmmakers around the world. He’s also an alumni of the British Academy of Film and Television Arts as well as a member of British Equity. With his ongoing efforts in community outreach and philanthropic projects, Danny has earned a well deserved reputation as a fighter for women’s rights and equality in a male dominated world of film. In our interview, Danny shares his compassion for women and feels that it’s time to honor women and their role both in society and on the big screen. Danny shares his immense passion in a short video contained in an interview by Religio Magazine. As a Spiritual man at heart, it was heartwarming to hear him speak from his heart urging us to be open to others of different faiths and religions, emphasizing our need for connection. Danny and I share a deep desire to affect change in the hearts of many, particularly the desire to put an end to judgments of others. We are in a world in desperate need of compassion and connection. When we judge another, we immediately separate ourselves from that person when the truth is we can never understand what we have not experienced. He goes out on a limb emphatically stating that we are all born with one united goal and that is love. He brings such passion into his work at the New Filmmakers Film Festival by working to afford equal opportunity to both men and women, and encourages people to look at their talent and not their gender. Danny’s utopia is a world where we are all connected and truly caring about one another and putting others needs ahead of our own. You can hear Danny live on our upcoming radio show on LA Talk Radio. Be on the lookout for announcements or download the podcast. No doubt, Danny’s passion and humble nature will win you over! Thank you, Danny De Lillo. The world needs more men to take stand as you have. You are a gift to women of all ages. You’re going to help us break through many glass ceilings in the world of film. 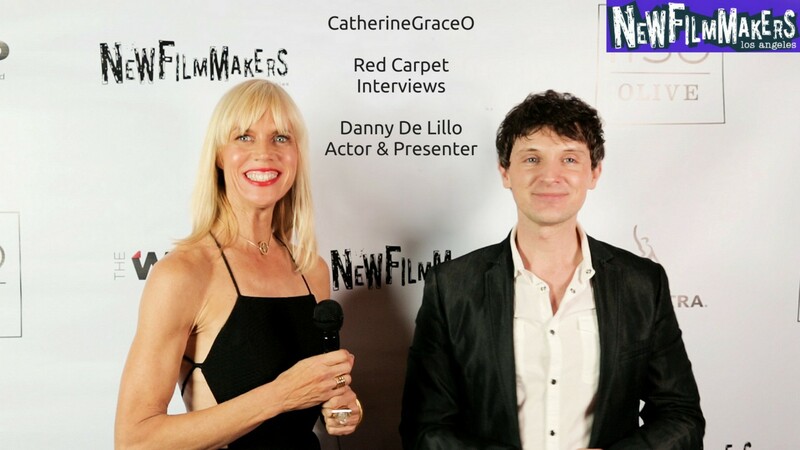 Danny De Lillo can be found at NewFilmmakersLA or send him an email at [email protected] to find out more about the incredible films and events. You can connect with him on Twitter @dannydelillo and on Instagram @dannydelillo.